Today I pulled out one of my fav. tops that I was going to wear; it's a white, empire-waits blouse with beautiful embroidery, and it totally made me think of Mexico! So I thought why not make that the topic for today! ?..So here goes..
Mexican Textiles have been shown more and more recently, especially this summer. A combination of bright floral prints and flowy, peasant skirts show a unique mix that has lately been absent in the fashion scene. This is a more softer approach brought to the runway that I am actually a huge fan of. Roberto Cavalli's Spring 2007 collection leaned more towards the "south of the border" theme, which I personally found very beautiful and unique. Detailed embroidery blouses and skirts add a folk feel that is perfect for spring/summer. 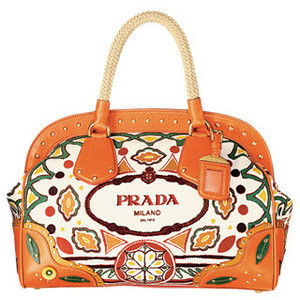 I am personally a huge fan of emroidery and bright colours if it's done right and a good example of this is Prada, and the handbag they designed with bright orange trim and pops of colour that;s perfect for the summer months. The Spring 2010 Couture Collection also showed many Mexican-inspired fashion, one that stood out the most was Jean Paul Gaultier; mostly for the beautiful, bold "sombrero-like" hats. There were also gauchos, striped peasant blankets, and spanish shawls. He even had a mariachi band!.. now who can top that !? I posted a few of my favorite looks from Jean Paul Gaultier's spring 2010 collection, and the last one has Lady Gaga written all over it!